EVEN WHEN it seems like nothing is going right and the cue ball is going out of its way to find trouble, world champions can rely on unmatched talent and dogged determination to flash brilliance. For a perfect example, we jump back to the 9-ball division at January's Derby City Classic. Just two rounds into the 285-player event, Darren Appleton had enough tough luck to draw fellow world champion Thorsten Hohmann. And from the start of the extended race-to-9 set, the Englishman couldn't find himself at the main TV table in the Accu-Stats arena. Hohmann jumped out to an early lead and worked his way onto the hill, 8-6. But a dry break gave Appleton control of the table, though it was far from an easy out. He had a difficult position play on the 6, which was blocked from the bottom left pocket. Appleton opted to get under the 6, so he could play it in the top right. But, as you can see in the diagram, he had only a slight angle, one that severely limited his options for the 7. Butted up to the short rail, the cue ball offered Appleton only a small sliver for a contact point. Undeterred, he powered up with plenty of follow and a touch of right English. He drilled the 6 in the corner, which barely caught the point on the long rail before dropping. 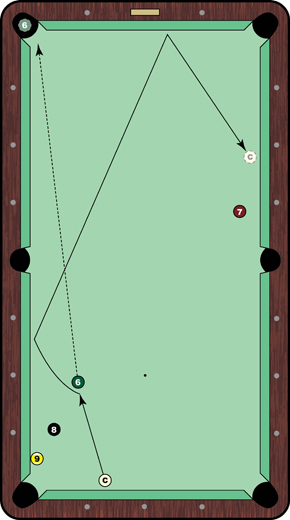 The cue ball curved forward and into the long rail, then spun off the top rail and into position for the 7. But when things aren't going right, they aren't going right. Appleton missed the 7, then hung the 9 after getting another chance at the rack. Hohmann advanced, 9-6, though Appleton claimed the shot of the match.